"..giving musicians the opportunity to symbiotically connect with electronics unadulterated with 'musical concepts', allowing the electronics to suggest to musicians new ways to approach sounds.."
With the permission of Serge Tcherepnin we are relaunching the fabled paper face modular system from 1973. All functions and appearances remains the same as it did 44 years ago, staying true to the origin of Serge Modular Music Systems. The panel graphics has been carefully reproduced with all its amazing hieroglyphic properties. The old adhesive paper has been replaced by silkscreen print: the only improvement we’re willing to make. Even though the circuits are 40+ years old they still function and integrate perfectly with modern electronic music systems. Standard control voltages between 0-5V and triggers and gates within the same range, a remarkable feature given the evolution of electronics. A big plus with the Serge Modular Music System has always been its use of banana jacks and keeping both audio and control voltages at the same level, making it possible to interchange the different signals seamlessly. A slew generator can be both an LFO, a low pass filter and an oscillator and more thanks to this. Welcome to patch programmability. Welcome to the people’s synthesizer. This fall we’re launching two sets of panels, followed by a third panel at the beginning next year. Panels are all mounted on a sleek aluminum chassi with internal PSU. Two oscillators, a wave shaper, filter and two voltage controlled amplifiers. It also includes a ring modulator and a very clever envelope generator. Rounding of with an adapter, making it possible to convert between banana jacks and 3.5mm. Noise source for white, pink and a dirty saw, plus sample and hold. Positive and Negative slew, the fore runners of the Dual Universal Slope generators, can be everything from processors to oscillators. A Triple Comparator followed by the necessary Dual Processor. And last but not least a Smooth & Stepped function generator, the multi dimensional tool for your everyday patches. 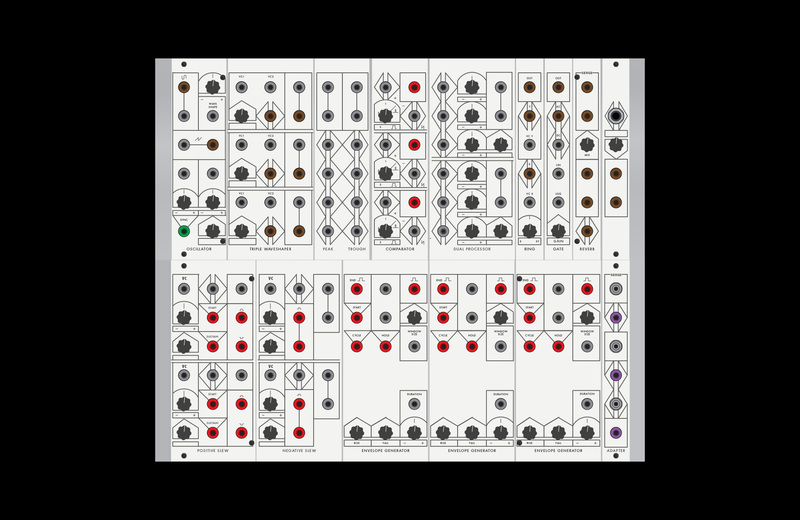 A modular sequencer. Patch the sequencer to the programmer for a classic sequencer action or trigger it manually for presets. The Bi-directional router supports as a sequential switch, pulse divider, source selector etc. the possibilities are endless! A simplistic yet complex selection of modules. Because fall is so far off we’ll be launching a limited DIY run this summer! 45 kits (Demand for the DIY kits did exceed expectations, we’ll increase the amount of kits offered!) consisting of two panels including PCBs, as a fun little starter pack. Don’t miss out on this! A creative system that can hold its own or complement any future investments! They look amazing! How do they sound? Here are some recordings made with the 73-75 system. A basic self playing patch. Two oscillators summed in the triple wave shaper, to the filter and then out! VCOs are controlled by the programmer. All over modulation by SSG, POS+NEG and the envelope, which cycles only on certain steps from the programmer. Bug music. The SSG is in feedback mode, where the coupler output goes to both the smooth and stepped sections. A bit of sample and hold is added to the SSG for the true bug sound. The SSG is then routed via the TWS and to the filter. Filter and TWS is controlled by the envelope in cycle mode. If you’d like to dive deeper into the history and knowledge of Serge Synthesizers check you www.serge.synth.net for historical documents and information. Courtesy of Ken Stone. Located in Stockholm, Sweden, we’re a tiny company that loves synthesizers. Aiming to bring the origins of Serge Modular Music System to the people.